Getting stung by a wasp launched me into endeavor to replicate an experiment by Jean Henri Fabre, a creationist and arguably the “Father of Entomology”. (See Fun with Fabre.) The result provided more proof about why evolutionism is irrelevant to science and everyday living. In searching the Internet for nest eradication ideas I came across a University of Georgia website that mentioned covering the nest entrance with a glass bowl. Just a few weeks prior I had read Fabre’s commentary on his experiment using a bowl to investigate the intelligence/instincts of wasps. I contacted Dr. Paul Guillebeau (Professor, Department of Entomology, University of Georgia) who was unaware of Fabre’s work. Guillebeau told me he was intrigued and wanted additional details. My source for the Fabre report is Fabre's Book of Insects, Dover Publications, Mineola, NY, 1998, Chapter X, Part I, page 87. His conclusion was that wasps had the instinct to dig IN under the "bell-glass" but could not teach, or "remember" to dig OUT. He devotes several interesting paragraphs to his observations. Site location: rural area about 10 miles southwest of Charleston, WV. Yellow Jacket nest location: on a 4 ft. bank (abt 75 degrees F) along a small drainage ditch that is dry except during rain. Temperatures for the observations were in the high 80's F. (one day may have been low 90's) during the day. Humidity was high. About 0930 Stung once on left forearm while trimming weeds. Arm became itchy and painful immediately, then hard and swollen within about 60 minutes. Treated with topical application of "After Bite" and internal dose of Benedril at night (once) and alternated with Aleve and Advil (one dose each) for two days. About 2030 (darkness about 2100) covered the hole with glass bowl. The bowl was immediately filled with yellow jackets. About one dozen stragglers appeared on the outside within abt five minutes. 0900 Many jackets are flying inside the bowl. About one dozen are around the outside going into various cavities in the weeds especially a dark cavity at the base of the bank about one ft. directly below the bowl. 1545 Same observations as 0900. Now several jackets are crawling on the jar lip and around the base. 1610 Mild to heavy rain. 2030 About 6 jackets flying around the site and going into various weed cavities. Only 1-2 are flying inside the bowl. Observed one crawling under the lip of the bowl and back out. Covered this with a brick. 0015 (aboutt) Very heavy rain. 1015 2-3 jackets are flying around the bowl area. 1-2 are inside the bowl. 1115 (Quick observation while passing the site in vehicle). Observed none flying on outside. 2000 No jackets are flying on outside and none on inside. None appeared when the bowl was tapped with my fingernails. 1200 At least a dozen jackets are flying in the bowl. They are not noticeably effected by my tapping on the bowl with the handle of a golf club tip (without its head). Three jackets are crawling on each other in a small hole abt 10 in. below the bowl. Covered that hole with a rock shortly after one of the three jackets flew out. 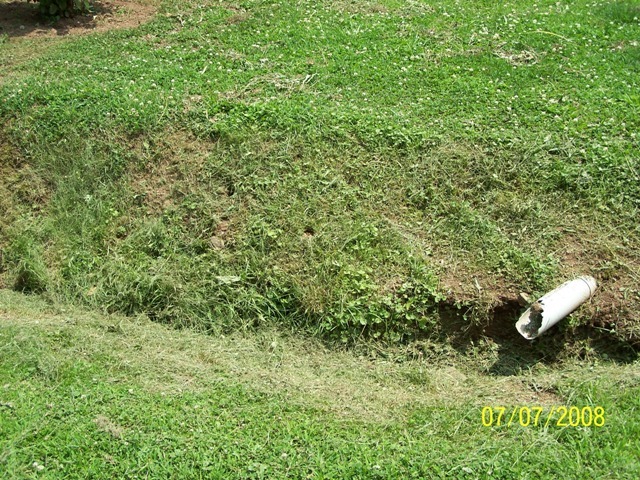 Two are flying in the area and seem interested in an area that appears to be an indentation in the bank at the base. The small hole (abt 1.5 in. dia.) is located about the one o'clock position and abt. 6 in. above the larger (abt. 8 in.) base indentation. Using the blunt end of the golf club, I compacted the mud on the left side of the rock immediately after one jacket crawled in. Using the golf club handle I was able to separate the weeds and see the mud. One other jacket flew around the compacted area. Arm is slightly itchy with negligible swelling and hardness. 1945 3-4 jackets seem to be "nesting" below the rock. 5-6 can be seen flying under the glass. Temperature in low 80's F and low humidity. 2120 Placed 2 in. cinder block below rock. 1045 Observed 1 jacket fly into the side of the cinder block. Two others were hovering around the block. No jackets observed under the bowl. 1400 No jackets observed under the bowl. None observed around outside. Poked golf club into space behind the block and tree jackets came out. 1945 Placed brick against band and touching right end of block. Six jackets came out. 2015 Placed brick on top of block and pressed into bank. About 15 jackets came out. All hovered around the block. 2025 Disposed of hovering jackets with Hornet-Wasp Spray. Removed bowl and plugged hole with Sevin. No jackets appeared before the hole was plugged. Is it possible the stragglers that avoided the bowl cover were trying to reestablish a nest? Temperature in low 90's and humidly increased, but not muggy. 1645 The main hole remains plugged. Two jackets are going in and out of small hole about 12 in.directly below. 1345 Used 6 ft. 4 X 4 to mash the area below the hole. The hole remains plugged. No jackets observed in area. 1450 No jackets sighted. Used foot to reinforce compacted area below main hole. 1130 No flying jackets. One dead jacket on the pasty Sevin plug. 1330 No jackets in the area. I asked Dr. Guillebeau a question. At first I considered the most likely explanation was another nest since so many were seen flying under the bowl. Then I began to wonder if the ones who were lose originally were just entering a cavity nearby by instinct. Do you think the jackets have a second entrance? They don't typically dig another entrance, but often there is a second natural opening. Dr. Guillebeau and I exchanged emails. Following is a very slightly edited transcript. In our locale, yellow jacket nests are disposed of by gasoline or Sevin. I do not use gas. The last one I disposed of was by soaking the entrance (in the base of a tree trunk) with a liquid spray. My father-in-law uses Sevin powder. The object is to force the jackets to carry the insecticide into the nest and spread the poison throughout the colony. In this case, I chose to end the observations because my father-in-law has to mow very close to the ditch bank where the nest was located. I think my notes noted when the colony likely died. My conclusion (and I am interested in your thoughts) is that the jackets remaining in the area were seeking to enter the nest through nearby cavities. One early observation revealed one that had crawled under the bowl. Since I placed the bowl early in the evening, there were many jackets still out of the nest. A rain shortly after I placed the Sevin caused it to from a pasty plug. The dead jacket found afterwards (on the plug) supports the idea that the wasps continued to try to enter the nest. Non dug out. All of my observations support Fabre regarding instinct. If you, as a professional entomologist, are going to recommend the bowl method I am interested in your reasoning. Other than observing jacket instincts, it seems like a prolonged way to deal with the problem. If non-chemical means are desired, there are other was to plug the hole. Sevin is very effective way to manage yellow jackets. If you used Sevin, I don't think the observations concerning the bowl mean very much. The Sevin would have killed them anyway. Sevin powder or liquid can work very well, but the object is not really for the wasps to carry the Sevin into the nest to be spread around. The pesticide needs to be placed in and around the entrance so that the wasps pick it up on their feet when they enter or leave the nest. We are not in a position to recommend the glass bowl yet because there are other questions to be answered. E.g., will a more simple plug kill the nest? I don't think that simply covering the entrance with dirt or blocking the entrance with a brick would kill them, but I do not know. You mentioned other ways to plug the hole; what are your ideas? I think I have a couple of nests on my property, so I am ready to try some other ideas. If the glass bowl is not necessary, it does seem to be additional trouble for no good reason. Unfortunately, gasoline is a common method for killing yellow jackets. Gasoline is not more effective than Sevin, and the human/environmental risks of gasoline are much greater than the risks associated with Sevin. The Sevin was applied after the bowl appeared to have eliminated the colony. However, the variable of the other flying jackets confused the observation. An idea that I had was to spray the expandable foam called "Great Stuff" at Lowes. It would require getting close to the nest, but the bowl did also. I understand. You applied the Sevin as a safeguard in case the bowl did not eliminate the colony. I had not thought about expandable foam, but it might work. I wonder if people would dig up the foam afterward and dispose of it properly. If not, I think Sevin might be the better choice, since the Sevin breaks down. I think expandable foam might stick around for a long time, and I don't know if it would leach chemicals into the soil. You have given me ideas, however. I wonder if you could drive a stake into the opening. You could possibly drive in a short stake that would block the hole and break down naturally. I do not know if the wasps would dig out around it or not. Regarding your last sentence: Fabre, and my limited, observations is the wasps do not have the instinct to dig OUT--only IN. I think driving a stake would be difficult to ensure a good seal. Although this experiment was not scientific (in the purest sense of the word) it verified the excellent scientific work of the great creationist entomologist Jean Henri Fabre. Also, clearly demonstrated is that evolutionism has no bearing on the reality of wasp life and behavior. Dr. Guillebeau identified the wasps as likely Vespula vulgaris or Vespula germanicus yellow jackets. (Wasps) patrol your yard and garden and eat caterpillars and other insects. When the weather cools down, the nest will die anyway. Keep your drinks covered or drink through a straw to avoid swallowing a yellow jacket. Wipe food and sticky drinks from your child's face and hands. If necessary, it is usually not difficult to get rid of a wasp nest. Locate the nest opening. 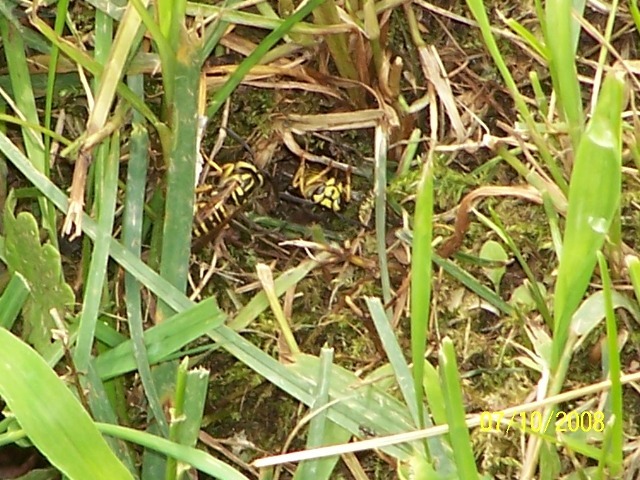 Yellow jackets usually nest in the ground. A pair of binoculars can be useful for locating the nest from a distance. 1. Use a can of wasp and hornet spray that will spray 20-30 feet. Spray the product in and around the nest opening. 2. 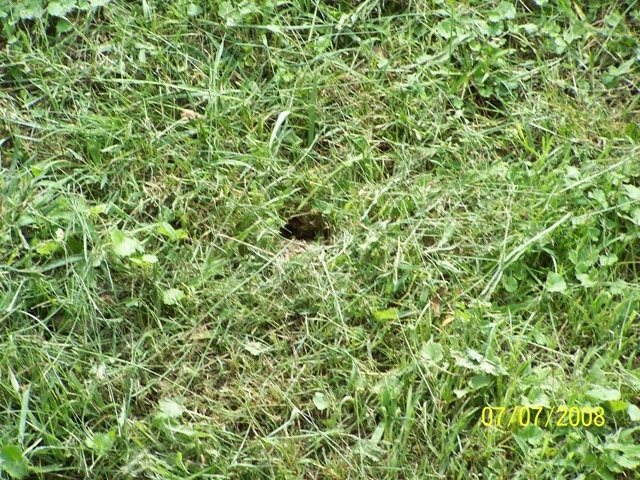 If you can get close to the nest, apply an insecticide in and around the entrance hole(s). A common household product called Sevin active ingredient carbaryl) is deadly to wasps. Make the applications at dawn or dusk when the wasps are less likely to be active. If you need to use a flashlight, cover the lens with a red filter. Otherwise, you may attract angry wasps to your location. Do not swat at yellow jackets. You may encourage them to sting. 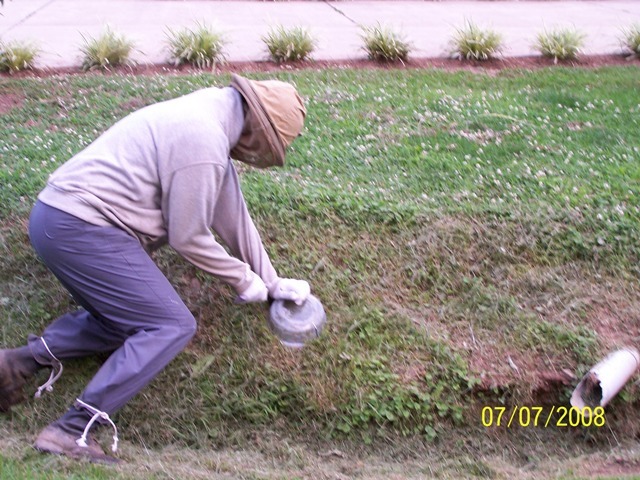 Drop us a line if you have ever used an inverted glass bowl to eliminate a yellow jacket nest (bugman@uga.edu). We need more information before we can recommend this nonchemical solution, but there is some evidence that it works. I have used this method twice in my own yard. Both times, it eliminated the nest within 4-5 days. We also talked a colleague into trying it. She kept the bowl over the nest entrance for about two weeks just to be sure. After digging up the nest after a fortnight, she reported the wasps were all dead. Other sources have also suggested that this strategy works. However, we do not have enough information to recommend it to our clients. We do not know why this method would work. It seems unlikely that the temperature would increase enough under the ground to kill the yellow jackets. Our hypothesis is that the nest runs out of food and/or water very quickly. Here is the method in case you want to try it. 2. Place a clear bowl(s) over the entrance(s). To reduce the chances of a sting, place the bowl either very early in the morning or at dusk when the wasps are not active. We do not advise doing it at night with a flashlight; the wasps may be attracted to the light and you. 3. It is imperative that the edge of the bowl fits tightly to the ground. You may need to pile sand or dirt around the bowl to seal the edges of the bowl. The yellow jackets will find any gap, but they apparently do not understand that they could dig under the edge of the bowl. 4. Observe the bowl during the day for a few days. If the wasps are escaping around the edge of the bowl, seal any gaps with loose dirt or sand. 5. Please report to us the success or failure of the project. I was intrigued by your message. Do you have additional details? I am interested in any further developments. I am particularly interested to know how many days elapsed from beginning to eradication of the nest. Thanks for the details. Many times, people that send me reports leave out some information that I think might be important. I like to have as much relevant information as possible. My wife discovered a nest, or maybe two, on our property. I will run some tests this week-end.